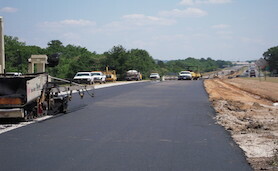 The I-59 project located between the Alabama Adventure Parkway exit and the 18th Street / 19th Street exit in Bessemer Alabama consisted of the rublization of the existing concrete pavement and re-using the materials as a base course for new asphalt paving. This was a time sensitive project that allowed for a shutdown of the interstate system (on direction at a time) to allow for the planned work to be performed. The contract was restricted to a 30 day duration for the North bound lanes and a 35 day duration for the South bound lanes. All of the interstate traffic within the project limits was detoured using I-459 and the local roadways to accommodate the 2.96 mile project limit. The work was consisted of 43,000 SY rubblizing continuously reinforcing concrete, over 50,000 tons of multiple layers of asphalt, bridge jacking to grade, improved drainage, grassing and stripping. Despite numerous weather events and other challenges, this project was completed earlier than the allotted time restraints and on budget.